A straw plant consists of the LINKA straw shredder with shredder drums which pull the straw upwards, preventing stones and other foreign objects passing back into the shredder drums, from where they can be removed. The straw shredder is available in a range of sizes depending on boiler size and is controlled by the load placed on the shredder drums. This means gear and motor overloading is avoided, ensuring that the straw volume set for the boiler plant is always correct. Shredded straw is transported from the shredder in a closed pipe system directly to the combustion chamber, where it passes through a cell sluice before being fed into the combustion hearth by a worm drive. A straw conveyor with height-adjustable legs is supplied, the length of which can be determined by boiler size and customer requirements. 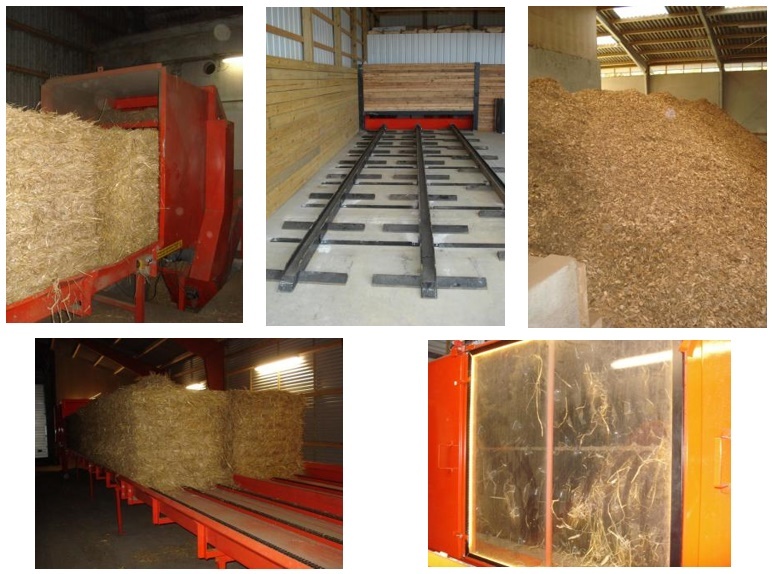 A woodchip plant consists of a scraper unit which is logically located in the immediate vicinity of the woodchip plant. Three (3) horizontal scrapers are positioned in the magazine which feed fuel to a countersunk lateral worm drive at the end of the scraper system. The worm drive is monitored by a photocell and when the drive is full, the hydraulic cylinders will activate the scraper unit, and stop again once the worm drive is full. The woodchips pass from here on an inclined worm drive directly to a cell sluice to be fed via another worm drive into the combustion hearth or a step grill. Whether to use a hearth or grill will depend on the condition of the chips, particularly with regard to water content. HEB columns are cast in-situ at the end of the scraper unit on which we build a plank wall over the lateral worm drive, and the drive itself along with the hydraulic cylinder mounts are also cast in-situ. A pellet plant consists of a silo unit which is logically located in the immediate vicinity of the pellet plant. An auger system feeds the pellets automatically and on demand from the silo to the stoker unit. The pellets pass from here on an inclined worm drive directly to a cell sluice to be fed via another worm drive into the combustion hearth or a step grate.